The salt pans and salt marshes "Las Salinas" are one of the mayor attractions. Both, birdwatchers and beach worshipers, are attracted by this unique and natural scenery. 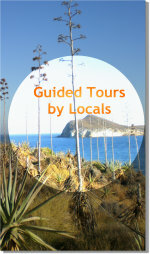 The area is located between the town of Cabo de Gata and the lighthouse. It is one of the largest wetlands in Eastern Andalusia. 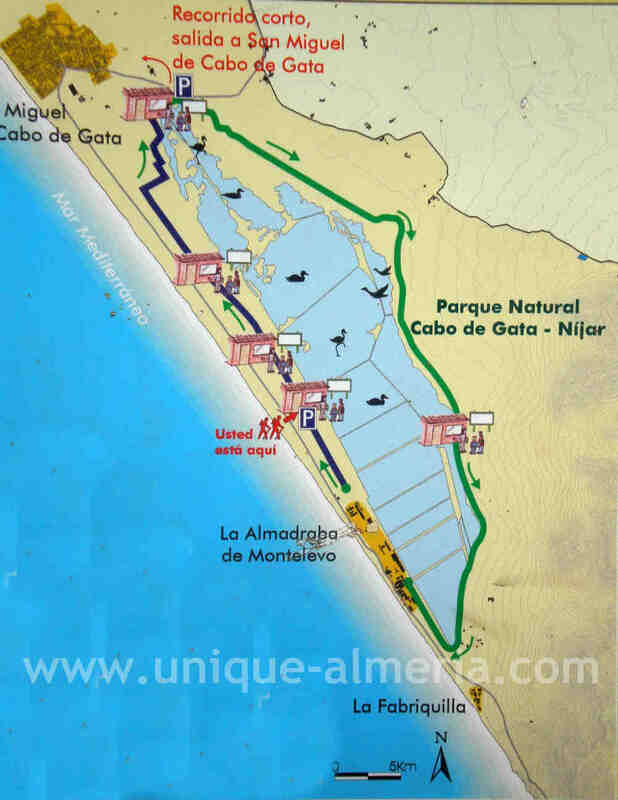 It lies on the waterfront, between a dune system and the volcanic mountains of the Natural Park of Cabo de Gata. The origin of the salt mining can be traced back to the period of Phoenician or Carthaginian. There is also archaeological evidence that there was salt industry during the Roman period. In classical books, particularly in the "Ora Maritime" by the latin poet RF Avieno we can read that the coast of Almeria was dominated by the Phoenicians, due to its commercial interests. 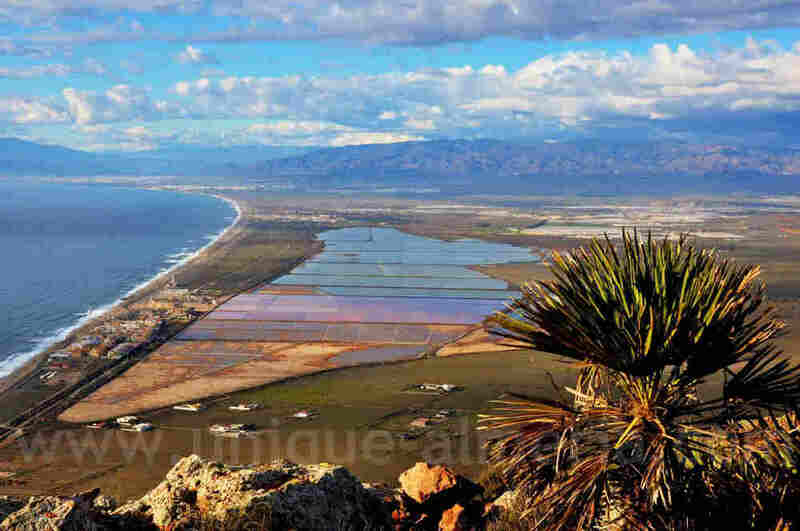 Some historians assume that the Salinas of Cabo de Gata could have belonged to the monopoly of the Kingdom of Castile and were partially leased to Moors and Arabs . In Spain during the Middle Ages the Crown had a monopoly on salt and its price in the regulated market. Today, production still continues. In fact it is the only remaining industrial activity in Western Andalusia and apart from its productive value, about 40.000 tons of salt per year, it has an even greater ecological value as it is the habitat of a large variety of fauna and flora. Industrial activities do not always have a negative impact on nature. Sometimes it can even be as favorable to biodiversity, that if it disappeared, significant ecological damage would be recorded . In environmental terms is known as "sustainable human impact on natural resources." This protected area comprises a range of unique features that benefits the much appreciated Flower Salt. The environmental conditions needed to obtain it, only occur during summer days, when huge temperature fluctuations in the salt pans do create floating crystals. 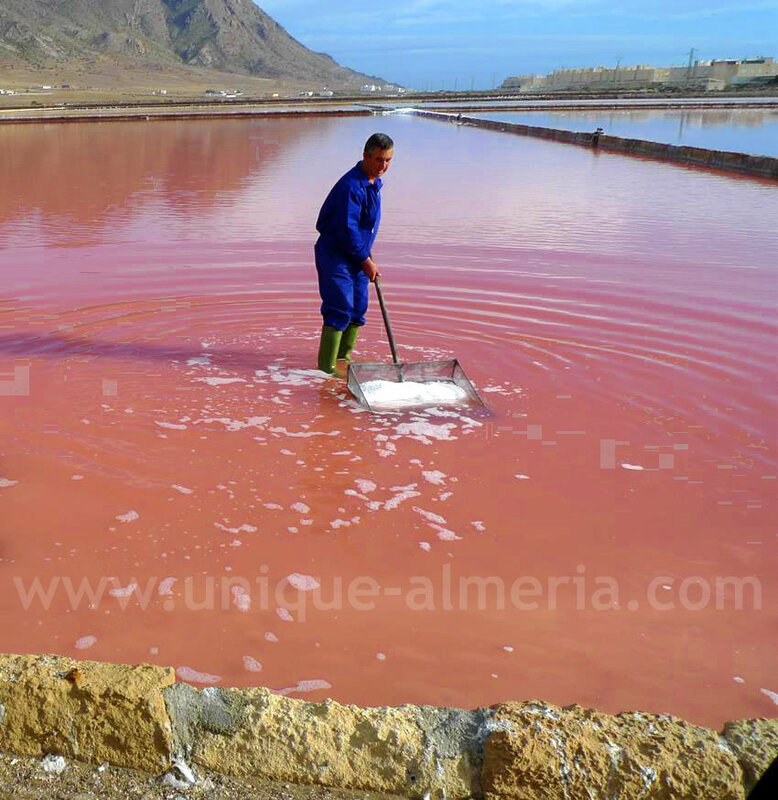 The cultivation is difficult, because the process of crystallization of the salt flowers occurs on the surface of the water at dawn, during dew nights. Harvesting is carried out only on days without wind to prevent the grain to go straight to the bottom and is done manually with a shovel. 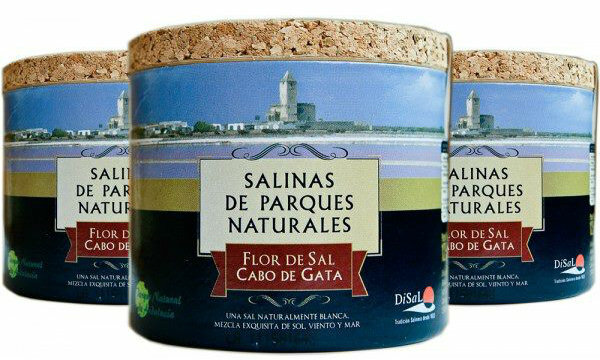 While the flower salt is now distributed all over Europe and available in many Gourmet stores, you can buy it in some of the small bars around this area as a souvenir! This sea salt contains significant amounts of calcium and magnesium, considered beneficial for the body. It is also distinguished for its flavor, due to the formation on the surface of the water, and the profusion of a micro algae called "Dunaliella Salina". This algea is responsible for the pinkish original color of the flower. However, but after a natural drying process it takes on its final white hue . 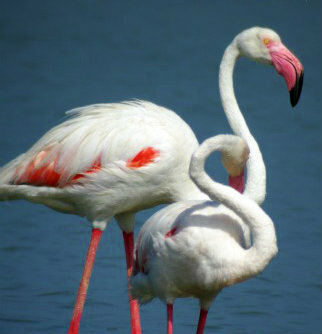 The Salt Pans and Marshes "Las Salinas" is a must stop for Birdwatchers. While access to the lakes is fenced for protection, there are several Lookouts for bird watching being two of them the most popular ones. Over 100 different bird species have been accounted in these wetlands, many of them using the salt marshes as a resting place on their migration. Amongst the many species to be observed, depending on migration and nesting time, there are: the Little egret (Egretta gazetta) - spring migrant, Kentish plover (Charadrius alexandrinus) - sedentary nester or Grey heron (Ardea cinerea) - spring migrant etc. But, the protagonist is, without doubt, the Greater Flamingo. The Church of "Las Salinas" is one of the most impressive icons in the area, attracting not only faithful locals, but also tourist, photographers and International filmmakers. The Church of "Las Salinas" which was opened in 1907 was built for the inhabitants of the nearby salt mine worker settlement, so they could attend religious services. Unlike the houses designed for workers , this temple stands on a platform to keep the water and sand out. It has an air of symbolic superiority over the rest of the buildings. The church is conceived under the prevailing eclectic architecture of the early twentieth century in the province . On December 25, 2004, the last religious ceremony was celebrated before its closure for restoration and it was re-opened in September 2012. It has become a popular site for local wedding celebrations ever since. You probably have guessed it already, yes! This site is also movie location in numerous films. 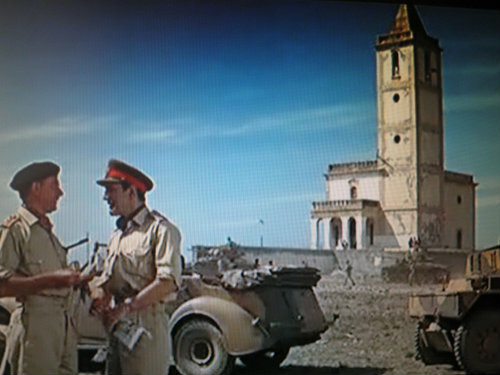 In 1969, Franklin J. Schaffner directed the ambitious 20th Century Fox production Patton, using this church as a backdrop to illustrate the advancing troops of Montgomery while coordinating the efforts of his army in Sicily. Schaffener also used other locations in the province such as the Cathedral courtyard, the "Cerro de San Cristóbal" and the Nicolás Salmarón Park in Almeria City, as well as locations in the Desert of Tabernas, Uleila del Campo and Felix. The site can also be seen in commercials and musical clips. This beach is probably the largest of all Cabo de Gata (some 6 miles long). It is one of our favorite place to escape from nearby Almeria city, specially in summer, during high season, since it is never crowded! There are days, during which the entire beach is for ourselves. 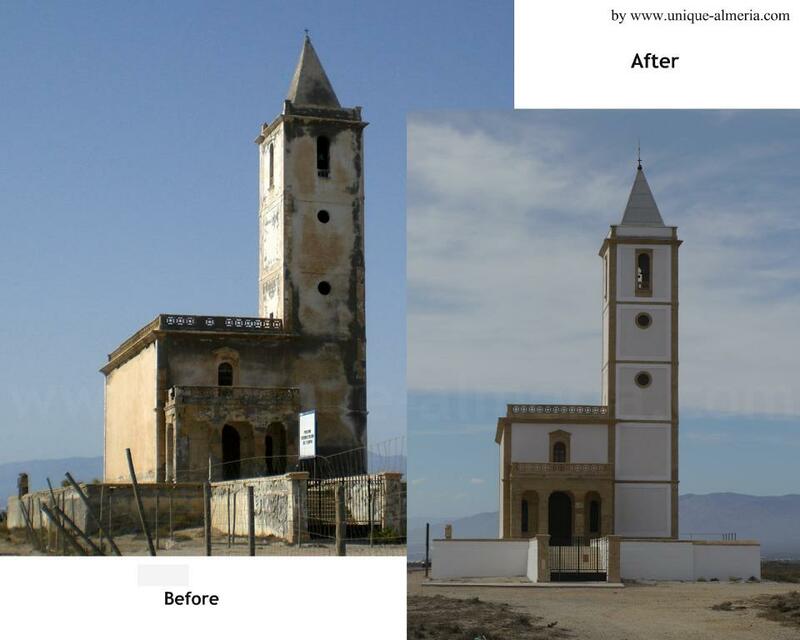 It streches from the village "San Miguel de Cabo de Gata" until the lighthouse.